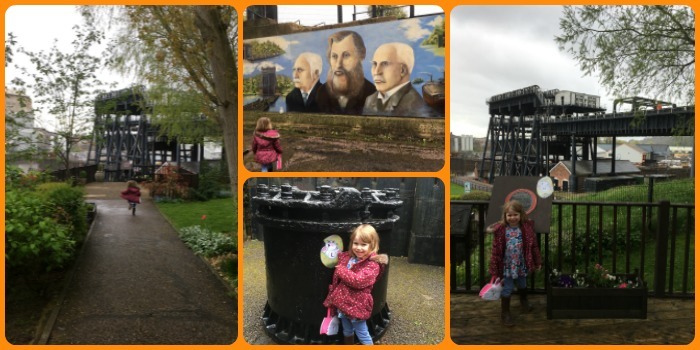 A family day out at the Anderton Boat Lift with the added bonus of an Easter Treasure Hunt. 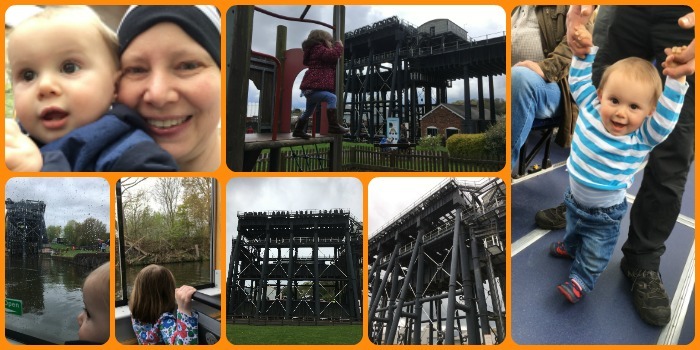 One of the things on our to do list when we moved up to Cheshire was to go on the Anderton Boat Lift and we chose to go on Good Friday. It also meant that we could fulfil one of the things that Little Miss A keeps asking to do - go on boat! We arrived mid-morning and as we got to the entrance we saw a canal boat going in to the lift so stopped for a bit to watch it. Then we went to buy our tickets for the Lift and River Cruise. Our allocated time slot meant about a half hour wait but that was fine as there is the museum to look around plus you can take a wander in the grounds. We filled the time by doing the free Easter Treasure Hunt which Little Miss A really enjoyed. She raced around finding the bunnies in the exhbition area and outside including in the maze. She liked the reward too of a Creme Egg! Doing the hunt meant that we got our first sight of the Boat Lift from below. It's such an impressive structure. 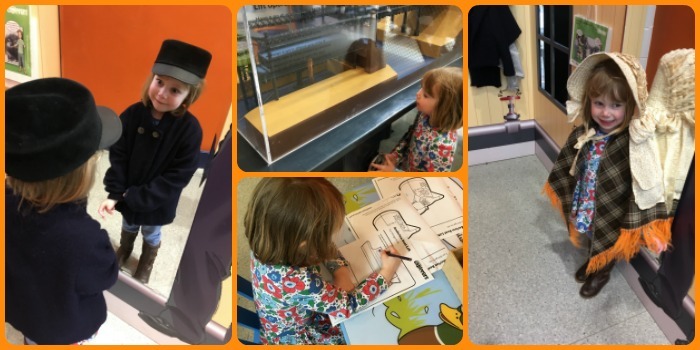 There was just time to explore the museum a little bit and for some dressing up, before we headed up to the Cafe to find Mr MoaB & Riley and go out to board the boat. Little Miss A looked so cute in the costumes. We boarded the glass sided boat at the top to go down the lift. There was a Guide on board who gave a really great commentary about the history of the lift, wildlife on the canal etc. 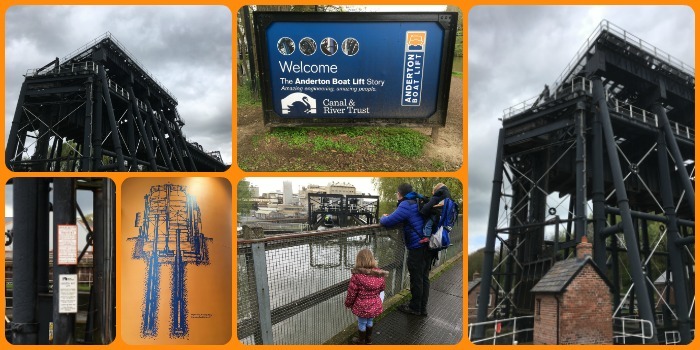 The boat cruise took about 90 minutes in total and we travelled along the picturesque River Weaver to Northwich and back. Baby R was more interested in walking about on the boat! We'd taken a packed lunch with us and we had ample time to enjoy this as we meandered down the canal. On our return we disembarked the boat at the bottom. This was the only slight negative as I was expecting to go back up in the Lift. 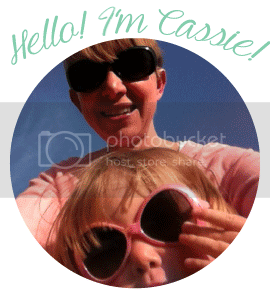 When we disembarked Little Miss A made a bee-line for the small playground and then played in the maze with her Daddy. We then spent a bit more time in the museum before heading home. You can actually explore the Visitor Centre including the exhibition area and grounds for free. You have the choice of just going on the Boat Lift, or like us doing the Lift and Cruise. Under 5s are free so we just had to pay for 2 adult tickets. More details, including prices can be found on the Canal & River Trust website. I am glad we've been on this historic structure and it was such a nice family day out.